Title Slide: Add your own title and edit the text on the cell phones. 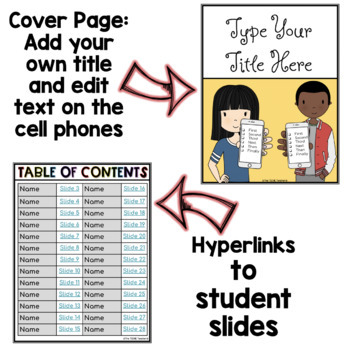 Option: Students could always work together to create a title page from scratch. Table of Contents: A prehyperlinked table of contents appears as the second slide. You or your students can type their name next to a slide number. There are 26 sections in the table. This is editable so you can add or remove sections you don't need. When the slide number is clicked, it will take students to their individual slide. 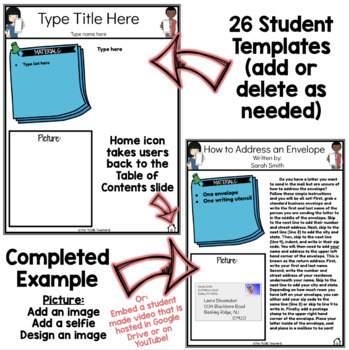 26 Student Templates: You can always duplicate or remove the templates depending on how many students are in your class. The template has an area for students to type their materials (this word is editable if you would rather change it to something else) in a list format. 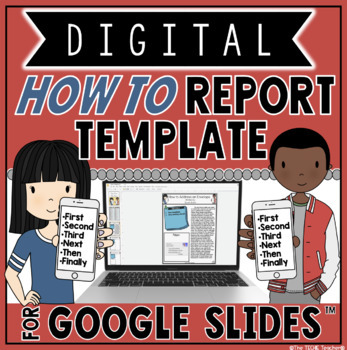 There is a large rectangular text box for students to type their how to report. Also included is a box that says Picture (this word is editable if you would rather change it to something else). Each slide contains a hyperlinked "home" icon that will take users back to the table of contents slide. Inserting a video the students created (would need to be hosting in Google Drive or on YouTube). Student directions appear in the speaker notes on all of the writing templates. 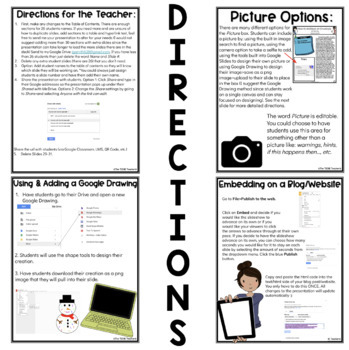 Easily share the final product with parents by emailing them the link or embedding on your class blog/website! Check out the preview to see everything that is included. This product comes as a link in a PDF file. First, make sure you are signed into your Google account. Click on the link and you will be prompted to "Make a Copy". Rename the file to whatever you would like. The presentation will be sent directly to your Drive!